Star director Sukumar has produced yet another youthful entertainer called Darshakudu under debutant Hari Prasad Jakka’s direction. New comer Ashok is being introduced as the hero with this film which is scheduled for August 4th release. On this occasion, we caught up with him for a brief interview. Q) How did you get the chance to work in this film? A) I worked in direction department for Sukumar sir’s 1 Nenokkadine. Meantime, director Hari Prasad met Sukumar with this story. An impressed Sukumar asked Hari to direct the film and when the discussion came about the hero Hari himself suggested my name to Sukku sir. Q) What was your first reaction, when you were finalized as the film’s hero? A) Firstly, when director Hari Prasad came to me and told about this, I took a day’s time and finally agreed to do the film. Q) What can we expect from this film? A) The film’s entire setup is a cute love story where I will be seen as the director and my love interest is a fashion designer played by Eesha. Q) Do you think this film is a big launch for you? A) Undoubtedly, it’s a great launch for me. Star heroes like NTR, Ramcharan and Allu Arjun have graced our film’s promotional events and helped our film a lot to reach a wide section of the audience. 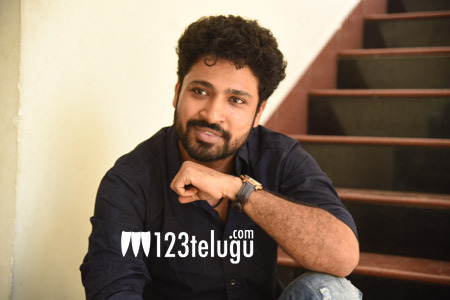 Q) Did you get any compliments from Sukumar? A) He saw the film and appreciated me for my acting. He also liked my dubbing and diction. Q) Which one is the toughest job acting or direction? A) I haven’t directed any film so I cannot say about it. But acting as a director was a bit tough job. Q) Tell us about your director Hari Prasad? A) He used to give scene paper and ask me and Eesha to do it in our own way. If any improvement was required he would suggest the corrections. He is a very calm and focused person.